The formiminotransferase (FT) domain of formiminotransferase- cyclodeaminase (FTCD) forms a homodimer, and each protomer comprises two subdomains. 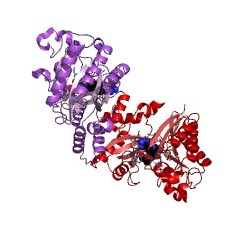 The N-terminal subdomain is made up of a six-stranded mixed beta-pleated sheet and five alpha helices, which are arranged on the external surface of the beta sheet. This, in turn, faces the beta-sheet of the C-terminal subdomain to form a double beta-sheet layer. The two subdomains are separated by a short linker sequence, which is not thought to be any more flexible than the remainder of the molecule. The substrate is predicted to form a number of contacts with residues found in both the N-terminal and C-terminal subdomains (PUBMED:10673422). The formiminotransferase (FT) domain of formiminotransferase-cyclodeaminase (FTCD) forms a homodimer, with each protomer being comprised of two subdomains. The formiminotransferase domain has an N-terminal subdomain that is made up of a six-stranded mixed beta-pleated sheet and five alpha helices, which are arranged on the external surface of the beta sheet. This, in turn, faces the beta-sheet of the C-terminal subdomain to form a double beta-sheet layer. The two subdomains are separated by a short linker sequence, which is not thought to be any more flexible than the remainder of the molecule. The substrate is predicted to form a number of contacts with residues found in both the N-terminal and C-terminal subdomains [(PUBMED:10673422)]. 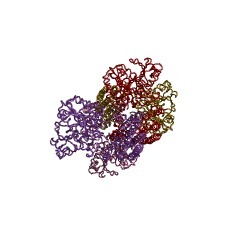 This entry represents the N-terminal subdomain of the formiminotransferase domain. There are 3086 FTCD_N domains in 3083 proteins in SMART's nrdb database. Taxonomic distribution of proteins containing FTCD_N domain. This tree includes only several representative species. The complete taxonomic breakdown of all proteins with FTCD_N domain is also avaliable. Click on the protein counts, or double click on taxonomic names to display all proteins containing FTCD_N domain in the selected taxonomic class.